looking southeastward across the landscape. Khafajeh is located on the east bank of the Diyala river, about 24 km from its confluence with the Tigris. The site comprises three relatively low mounds. Mound A lies to the north-northwest; a single mound with two prominences called Mounds B and C, lies to the southwest; and Mound D lies to the southeast. The flat area between the mounds probably is also part of the site, since soundings between Mound A and Mound B-C yielded occupation debris (Frankfurt et al. 1932). Mound A was occupied from late Uruk period through to the late Akkadian period (circa 3200–2150 B.C.). Mound D was occupied only during the Ur III, Isin-Larsa, and early Old Babylonian periods (circa 2120–1700 B.C.). And Mound B-C, which may have been occupied during those periods as well, was occupied in the late Old Babylonian and Kassite periods as well (circa 1700–1500 B.C.). Historical evidence bearing on Khafajeh's history is not extensive. From the early Dynastic period through the early Old Babylonian period Khafajeh's name was Tutub (Harris 1955). Under the dynasty of Akkad, this was an important administrative center, since it had a governor (énsi). In the late 3rd millennium B.C., the city was under the control of the kings of the Third Dynasty of Ur: it is listed in an administrative text dated Ibbi-Suen year 2, which records payment of taxes by cities in the Diyala region. Then Tutub fell under the control of nearby Esnunna (about 50 km northeast of Baghdad). It later established its independence, but in Warassa's reign, it fell once more to Esnunna. 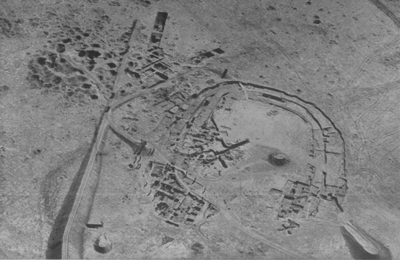 Little is known of Tutub following Warassa's conquest, though inscribed clay cylinders do record that Hamurrabi's son and successor, Samsuiluna, built a fortress (Dur-Samsuiluna) at what is now Khafajeh's Mound B.